Brief Description A world premiere written and directed by Armen Pandola. 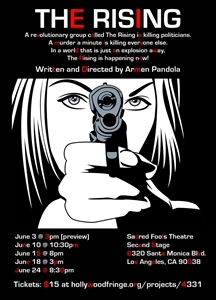 Description World Premiere of "The Rising" written and directed by Armen Pandola at the Hollywood Fringe Festival. "The Rising" is a dark comedy about the rise of a revolutionary group who murder politicians. In a world that's only an explosion away, "The Rising" is happening now. Add The Rising to your free online travel itinerary.